[The disciples] told what had happened on the road, and how Jesus had been made known to them in the breaking of the bread. 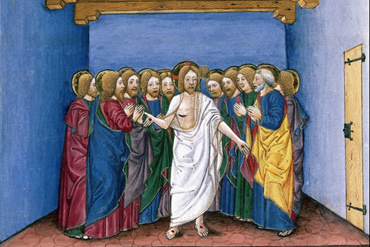 While they were talking about this, Jesus himself stood among them and said to them, “Peace be with you.” They were startled and terrified, and thought that they were seeing a ghost. He said to them, “Why are you frightened, and why do doubts arise in your hearts? Look at my hands and my feet; see that it is I myself. Touch me and see; for a ghost does not have flesh and bones as you see that I have.” And when he had said this, he showed them his hands and his feet. While in their joy they were disbelieving and still wondering, he said to them, “Have you anything here to eat?” They gave him a piece of broiled fish, and he took it and ate in their presence. Then he said to them, “These are my words that I spoke to you while I was still with you – that everything written about me in the law of Moses, the prophets, and the psalms must be fulfilled.” Then he opened their minds to understand the scriptures, and he said to them, “Thus it is written, that the Messiah is to suffer and to rise from the dead on the third day, and that repentance and forgiveness of sins is to be proclaimed in his name to all nations, beginning from Jerusalem. You are witnesses of these things. The disciples thought they were seeing a ghost, and Jesus was at pains to assure them that he was no ghost, no projection. Ghosts don’t say, “Have you anything here to eat?” If Jesus is not truly risen he is only a ghost. Ghosts are the past that didn’t die properly. 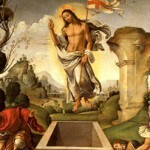 If Jesus did not truly die he is not truly risen. He had to die in the past so that he could be with us in the present, “the first-born from the dead.” We too have to die to the past if we are to meet him where he is. “If we have been united with him in a death like his, we will certainly be united with him in a resurrection like his” (Romans 6:5). When we can find no security in the present we look for it in the past. “The past at least is secure,” said some failed politician. But while the past may give a feeling of security, it does not give security – because time is moving, not fixed. Or we look for security in the future. We are always looking for a railing to hold onto, because the ground under our feet is moving. I always feel we would prefer an unresurrected Christ. He would be fixed and immovable, altogether more stable. We could own and control him. But he is risen, he cannot be owned, he is the vehicle of the Spirit which blows where it wills. God “has restored the joy of our youth.” Joy is there when we put ourselves fully into something. Small children, when they laugh, are all laughter; when they cry they are all sadness. But a little later we learn to drag ourselves along: half-way into things and no more: half in and half out, hovering like ghosts. If we walked like that we would resemble someone a hundred years old. When we walk freely we put all our weight on the forward foot; we entrust ourselves to the future and we leave the past behind. Ghosts don’t do that; they don’t walk, they don’t do anything. We real human beings have to learn to go fully into everything we do and say and think, to ‘die into’ everything. Then we will know something about resurrection.